FBA-25A: Vertex-Standard brand Alkaline battery case. Fits many Yaesu, Vertex, and Standard-Horizon radios. Provides instant power when loaded with 6xAA Alkalines or other dry batteries. 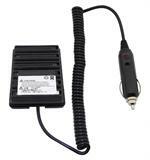 Fits radios such as VERTEX VX-110, VX-120, VX-127, VX-150, VX-160, VX-170, VX-177, VX-180, VX-210A, VX-400, VX-800, VXA-150, VXA-210, VXA-300, VXA-300 Lite; Yaesu FT-60R, FT-250, FT-270, FT-277, FTA-230, FTA-310, Aviator Pro II, Aviator Pilot II, Aviator Pilot III, Aviator Pro V, Aviator Pro VI; STANDARD-HORIZON HX270S, HX370S, HX500S, & HX600S. Provides handy instant high-watt power! Replaces original model #s FBA-25, FBA-25A. 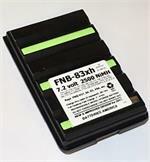 Fits radios that accept FNB-64, FNB-83, FNB-V57, FNB-V94. This is a Vertex-Standard brand OEM product ! Comes in factory box. Pricing is for ONE battery case. 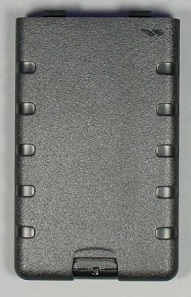 Picture shows both sides of the battery case.